Hey everyone, I’m Justin Briggs. I’m an SEO Consultant at Distilled in Seattle and an SEOmoz Associate, which is where you’ll usually find me blogging. I feel that manual outreach, as a link building practice, gets a bad name at times. It’s positioned as a tedious, dreadful task that’s not that effective. The majority of the link building work that I do every day is direct outreach and it’s highly effective. Today, I want to share some ideas about how I do outreach. Some of this may seem time consuming, but much of this process is done quickly using processes, APIs and Excel. Other parts of my method are built into content creation or simply done in my head on the fly. Your content/pitch is better than average. The offer/content/pitch provides some level of value to others. Offsite SEO isn’t gaming or “placing” links, it’s marketing. This persona will guide your content creation and outreach. Let’s say I’m pitching the story of how Seattle won the world record for the largest zombie walk as a way to promote the upcoming ZomBcon in October. 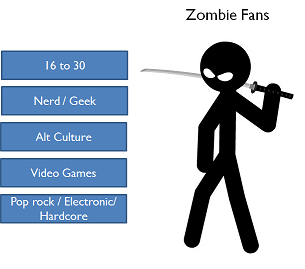 I may develop a number of personas including geek bloggers, Seattle events journalists, and even zombie fans. These are the people you’ll be pitching. It’s important to remember you’re pitching people, because websites don’t give links, people give links. What are the types of things they’ll respond to? What’s the value add your pitch offers them? What’s their turn-ons and turn-offs? If I want to know more about a persona, here is a fun little hack. Perform a search on FollowerWonk for “zombie” and put that URL into TagCrowd. So a few words to describe zombie fans would be: tech, design, music, iphone, vampires, sci-fi, robots, geek, gore, horror, and beer. That paints a nice picture. Or how about a search for Harry Potter: jonas, gaga, youtube, swift (taylor). Yes, this is completely unscientific. 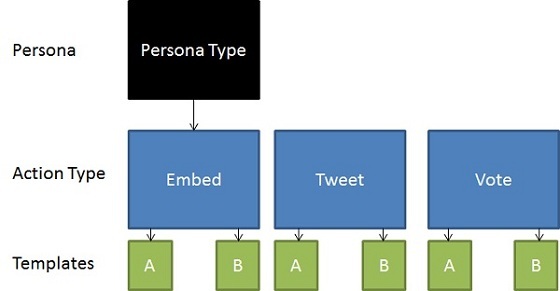 I’ll think of one to a handful of personas at the start of a link building strategy. These define my prospecting and my content creation. I’ll continually refer back to these. Persona building in a traditional sense is more complicated than this, but these helps demonstrate a quick way to think of your prospects, and is a step often left out by link builders. From my experience, having a well-defined target audience for a piece of content is often a major contributing factor to its success. That’s where a persona comes in. Create content with this one single person in mind. This sounds obvious, but it’s surprising how often a piece of content is created without knowing who’s going to link to it. I’m not going to invest time to develop content for link building until I’ve confirmed the audience is in place. Prospecting for link sources is such a diverse topic but here are some tips. #1 Use tools like Ontolo to automate processes. There are a ton more. I’d read Tom’s post on scraping with Google Docs. I recommend checking out the scraper I built to evaluate links. Read this post from Ben to learn how to use the SEOmoz API. 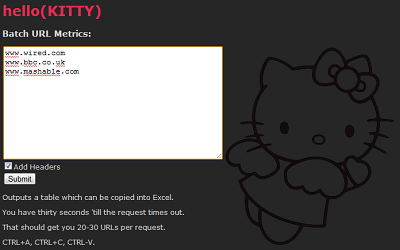 Use this to build tools like our hello(KITTY) toolset (made by Ben), which is an internal tool that batch processes a list of URLs for SEOmoz metrics. This allows you to quickly sort and prioritize. If you’re curious, HELLO stands for Here is Every Link Linkscape Offers. Use tools like FollowerWonk (we built a tool to scrape this), curated lists like Alltop, use Open Site Explorer to backtrack links to similarly successful content, and search for successful content on Topsy. Once you have prospects, it’s time to prioritize them. I tend to prioritize outreach by the likelihood to link, link metrics, and multiplier effects. This is a soft metric for the most part. Based off your persona, and the persona of a linkerati, what’s the chance this site will link to your content? This is where SEOmoz data and the API comes in. You can use DmR, mR, mT, DmT, PA, and DA to sort links. If I’m getting a new post/page on a domain, I’ll sort by domain metrics. If I’m snagging a link on an existing page, I’ll sort by page metrics. The metric you sort by may depend on the factor you’re looking to aquire. Maybe through competitive backlink analysis you’ve determined you’re short on trust, in which case, you can sort by DmT. This is the site’s ability to spread content further than simply placing the link. 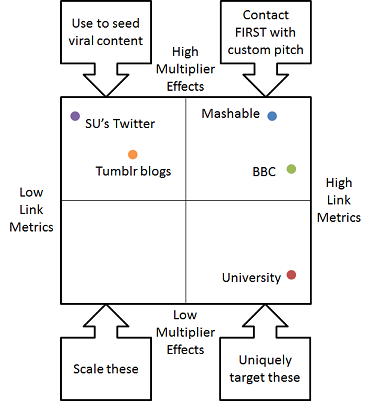 For example, getting an article on Mashable is likely to spread content further than a link from Harvard.edu. Although the Harvard.edu link may likely be a stronger individual link, Mashable has the potential to generate links from multiple additional domains, whose summation of value is greater than that of Harvard.edu. Before doing outreach, I categorize my contacts. One way to do this is to bucket leads into high, medium, and low buckets based off your objectives. If I’ve pulled link based metrics, for example, I may sort prospects by DA and place them into buckets based off the relative value of their DA. High – Create a high level, customized outreach email. Potentially offer a unique angle or piece of content for their site to ensure coverage. Medium – Use a base template, but collect the contact’s name and supplement the template with a custom intro. Low – Use a standardized template to scale. This diagram summarizes my thought processes for launching linkbait content, such as an infographic. This is one way I make manual outreach scale. I uniquely identify the prospects that have the greatest likelihood of giving an additional push. I think as the social landscape of the web has changed, that strategic targeting on high multiplier sites is the new content seeding, as opposed to just needing a strong Digg account to submit your content. I particularly like the story about how iDone This earned 5,000 users by constructing custom narratives for influential communities. It’s one of my favorite link building articles in the last year. That’s not to say there isn’t immense value in appearing on social media sites like Reddit. I’ll start a campaign by selecting a small number of sites with the highest multiplier and link metrics. These sites will be pitched uniquely. If I can get these sites to bite, it may set me up for a flood of incoming traffic, shares, and links I can start capitalizing on. Outreach templates are a hard topic to discuss, because I can’t give a full example. First, I can’t share my client work most of the time, and even if I could, those emails might not work for you. Every outreach type is unique. They may share elements, but many variables dictate my outreach templates. Let’s say for example that I want to do outreach to SEOmoz. Your first instinct might to be to email Rand, and if you did so, I’d get to the point. He’s the owner of a company, travels, presents up to 50 times a year, and has a lot of other responsibilities. He may not be “close” to the site’s code and would likely not make the direct change. If I wanted to snag a link on a page, that wasn’t a blog post, I’d email Casey. He manages “marketing web development projects” and “content development projects”. He’s a busy guy, but he’s at least not running SEOmoz. He also is into photography, likes to play with chainsaws, and he’s accessible on Twitter. These may all dictate my approach. In all seriousness, do not tell me that you think my site is a “great resource of quality content” or ask if I knew that links help rankings. When I get these, I feel like this. This email isn’t as useful as I’d like, since it’s censored, but this is the standard embed request template from my last infographic. The language and the positioning of the request was completely dictated by the persona I designed for the content. I came across your site recently and wanted to share this new (dare I say awesome) <removed> infographic I’ve been working on. It’s based on <removed>. I thought you might really enjoy it. If you do want to share it, there is an easy to copy embed code on the post. That’s it. That email got me direct links from 150+ unique linking domains. For the medium to lower level prospects, there was little to no customization. However, it was written to the persona I was looking for when prospecting, so it was already fairly well targeted. When SEOs discuss scaling link building, they often discuss tools, outsourcing, and processes. These are all methods of minimizing the time requirement of actions so you can fit more actions per unit time. However, that’s only one way that link building scales. Instead of focusing purely on the mechanical scaling, I urge to improve your ability to scale relationships. Often the advice is given to build relationships first, that you need relationships to get links. The retort is often “but that doesn’t scale!” – well yes, not in the sense you may traditionally consider scaling. I’ve somehow, as an introvert, became someone that’s often described as genuine, affable, personable, unassuming, and authentic. These are traits that come in part naturally (because I do care about people) and in part through practice. I make regular practice of talking to strangers, purely for practicing my ability to socialize, because I, honestly, feel quite awkward. I quickly learned that authenticity scales relationships. I do not need to maintain a deep relationship with someone in order for them to feel that we have connected, that we can relate, and that I’m genuinely approaching them about something. This is why generic outreach templates, in my opinion, are less effective, because there is no authenticity. They’re robotic. I can pitch a Domain Authority 98 site and get a link (yes, really) with no previous relationship because my pure enthusiasm about the content opened that door for me. I’m not pitching them a link, I’m pitching them my passion, my story. People love a good story. Creating personas allows you to create this “person” in your mind and speak directly to them, which allows this level of authenticity to scale without needing to know each individual person. When I develop my templates, I break them out by persona, pitch type, and template variations. It looks a bit like this. For each persona I’m targeting, I decide on the action I’d like them to take. This may be placing a link, accepting a guest post, tweeting content, or embedding an infographic for example. Then for each action type, I’ll develop multiple templates to test. These may vary dramatically in story and pitch concept, or may be very minor changes in wording. After I start sending emails, I’ll shift towards the templates that are most effective. This works well with tools like Tout, which monitor stats related to open rates and CTR. I also monitor for link placement rates as well. I feel a persona based, authentic, and marketing focused approach to outreach allows link building to scale relationship building. This is particularly helpful in agency settings, where I may not maintain relationships in a niche, but need results sooner than later. Ideally, I’d like to build deep relationships with all prospective link opportunities, but this is not very feasible. I’d love to hear more from you guys about your experiences in link building. I'm Justin Briggs and an SEO Consultant at Distilled in the Seattle office and an SEOmoz Associate. I'm active on Twitter and often write about link building, although I do quite of bit of technical SEO as well. My background is in web development and affiliate marketing, and I worked as an SEO Manger at an agency before moving to Distilled.